Japan-America Society and National Cherry Blossom Festival Continue the Gift of Trees – The Japan-America Society of Washington, Inc.
WASHINGTON, D.C. – The Japan-America Society of Washington DC and the National Cherry Blossom Festival joined forces Thursday, May 4 to plant three cherry blossom trees at Amidon Bowen Elementary School in Southwest DC. 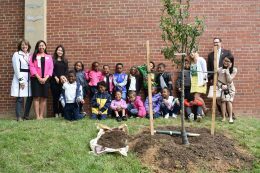 Students from the kindergarten at Amidon Bowen were also present to help plant the trees and recount what they had learned about Japan through the Society’s Japan-in-a-Suitcase educational outreach program, which visited the school last December. Executive Director of the Society Marc Hitzig also presented the students with Eliza’s Cherry Trees, a picture book which depicts the history of cherry blossom trees in Washington, D.C.
Amidon Bowen is the third location to receive the trees as part of a sponsorship program heralded by the Japan-America Society, with additional support from the National Cherry Blossom Festival. The school was chosen because its prior participation in the Japan-in-a-Suitcase program as well as its location, which is near the site of the Society’s annual Sakura Matsuri – Japanese Street Festival. For more information, please contact Executive Director Marc Hitzig at mhitzig@jaswdc.org.